I enjoy politics.Â If anything, I get a little too involved.Â I listen to public radio every day, read Slate and The New York Times every day and have taken to talking back to the radio when someone, inevitable John McCain, says something stupid.Â Politics are fun.Â Itâ€™s like sports that actually matter.Â Now thereâ€™s a chance for you to teach the children in your life about politics or take a look back on some of your first memories of them. Starting this September 23rd, now available on DVD from Walt Disney Studios Home Entertainment comes the ultimate collection of fun ways to learn about politics and the great ways they influence our lives.Â Schoolhouse Rock â€“ Election Collection â€“ Limited Edition is ready to burst into your living room with a killer dose of the original learning made fun and show you what political education is all about.Â Bring home this legendary collection today! This fantastic collection of fun and classic songs includes fifteen of your all-time favorites.Â Those songs are â€œNo More Kingsâ€, â€œFireworksâ€, â€œShot Heard Round The Worldâ€, â€œThe Preambleâ€, â€œThe Great American Melting Potâ€, â€œMother Necessityâ€, â€œSufferinâ€™ Till Suffrageâ€, â€œIâ€™m Just A Billâ€ (my all-time favorite), â€œThree-Ring Governmentâ€, â€œIâ€™m Gonna Send Your Vote To Collegeâ€, â€œTyrannosaurus Debtâ€, â€œTax Man Maxâ€, â€œWalkinâ€™ On Wall Streetâ€, â€œEnergy Bluesâ€ and more. The special features included in this DVD are the Disney FastPlay option, a new song â€œPresidential Minute,â€ two surprise endings and a fantastic election tracking kit. These retro songs and cartoons are completely fantastic.Â I feel like I could flip the channel and see Richard Nixon saying that he is not a crook and it wouldnâ€™t even be strange.Â These songs are wonderful and I love the hopeful optimism about how great America is and how great weâ€™re going to be.Â Thatâ€™s not something we see a whole lot of lately, especially not out of the Republican Party.Â I have learned many things from watching these songs.Â I especially remember how a bill becomes a law.Â I love that song and I guarantee that you will love it too. Itâ€™s time to Rock out, old school. 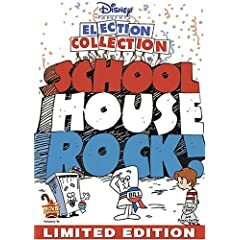 No user commented in " Movie Review: Schoolhouse Rock â€“ Election Collection â€“ Limited Edition "